Make sure to have all the gear you need before you drive to Crescent City. 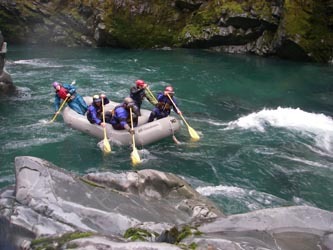 You will be in the remote reaches of California and quite literally will be upstream without a paddle. We have heard one story of someone who forgot a helmet on a kayaking trip to the Smith. While water flows were perfect and the weather was in rare form and actually sunny, he had to turn around and drive home. With that being said, here are a few places to try if you need last minute outdoor/ camping gear. Escape Hatch Sports: 960 3rd St. Crescent City, CA 95532. (707) 464-2614. This is one of the few places you can find camping and adventure equipment in Crescent City (remember this is a tiny town). Rick’s Outdoor Shop and Tackle: (707) 464-2186. Technically, the store name is Rick’s Haircuts, Outdoor Store, and Tackle, so if you happen to need to cut your hair while buying outdoor gear and fishing supplies, Rick’s is your place. Bucksport Sporting Goods: 3650 Broadway St. Eureka, CA 95503. (707) 442-1832. Northern Mountain Supply: 125 W 5th St. Eureka, CA 95501. (707) 445-1711. REI.com : Great named brand gear at affordable prices. Visit a retail store or shop online. Altrec’s Outlet Warehouse: 30-60% Off : Huge discounts on named brand gear from Patagonia, The North Face, Marmot and more.